Sprinkle chicken with salt and pepper. Heat oil in Presto® Pressure Cooker over medium heat. Brown chicken, about 2 minutes on each side. Add water, rosemary, and bay leaf. Close cover securely. Place pressure regulator on vent pipe. Cook 4 minutes at 15 pounds pressure. Cool cooker at once. 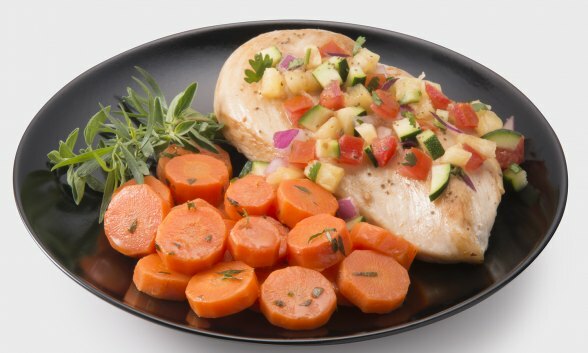 Serve chicken breasts topped with salsa. Combine pineapple, tomatoes, red pepper, onion, cilantro, jalapeño pepper, and lime juice in a medium bowl. Toss gently. Chill for 1 hour to blend flavors.